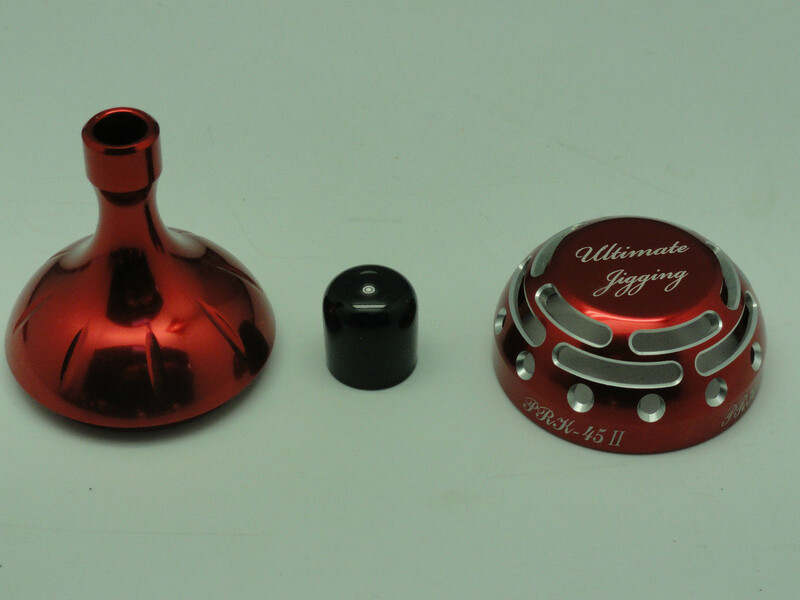 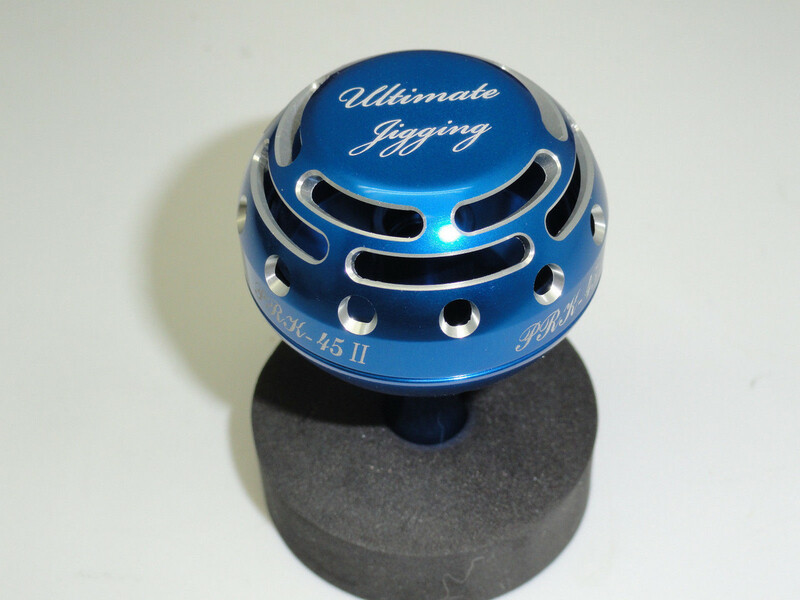 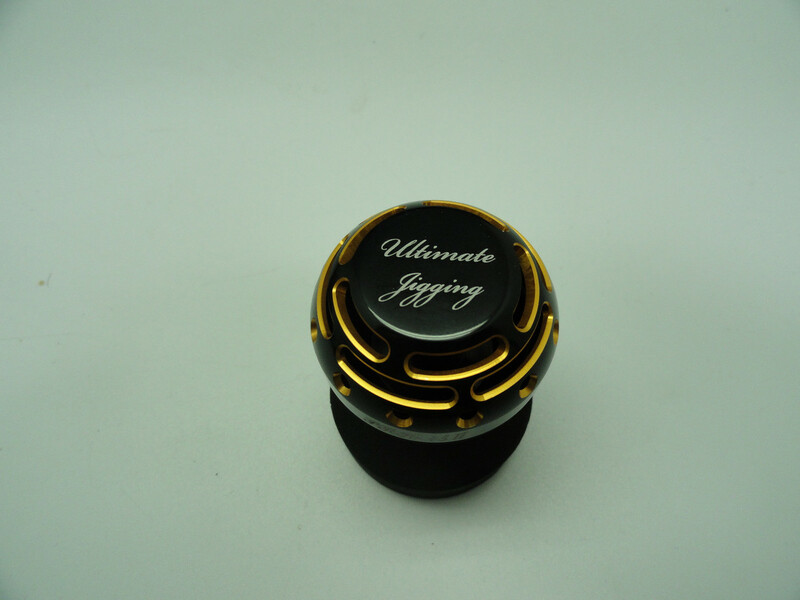 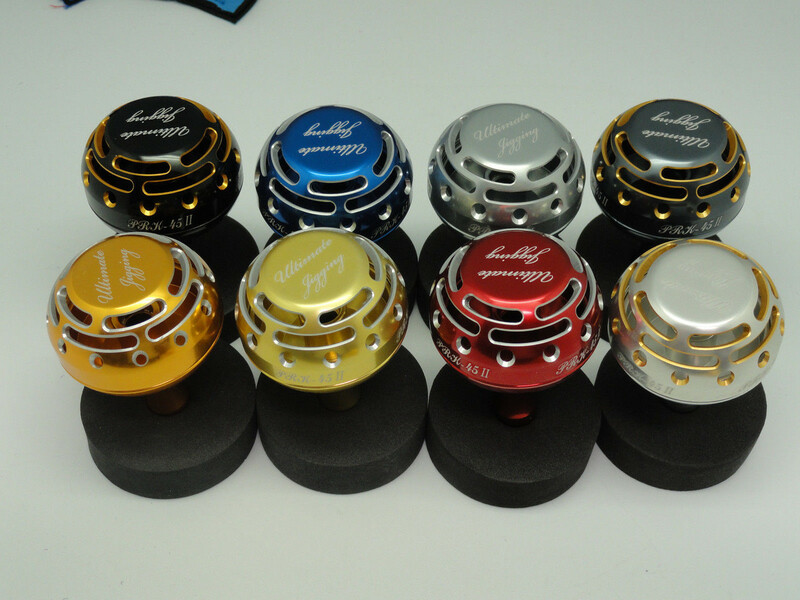 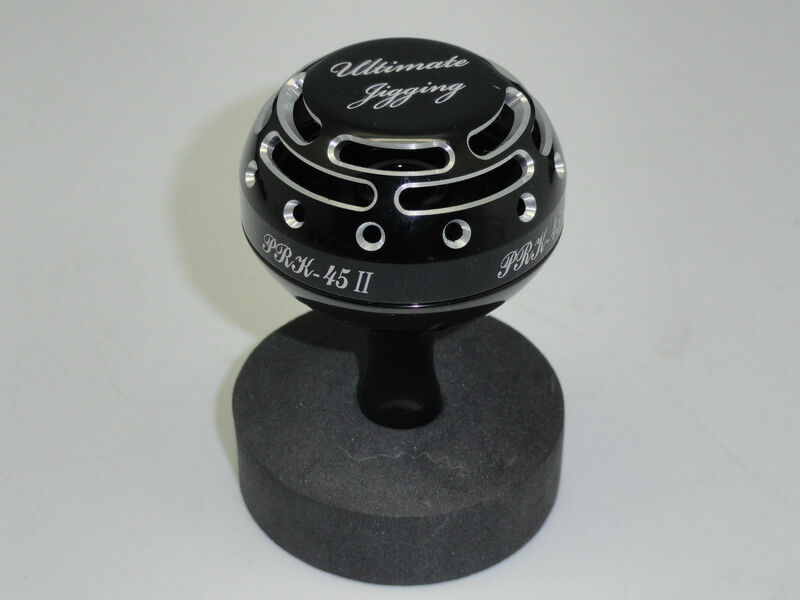 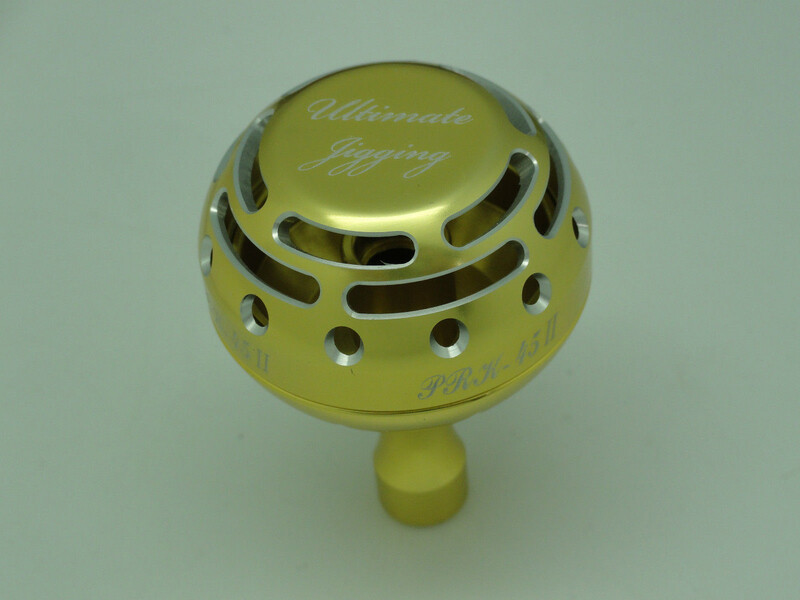 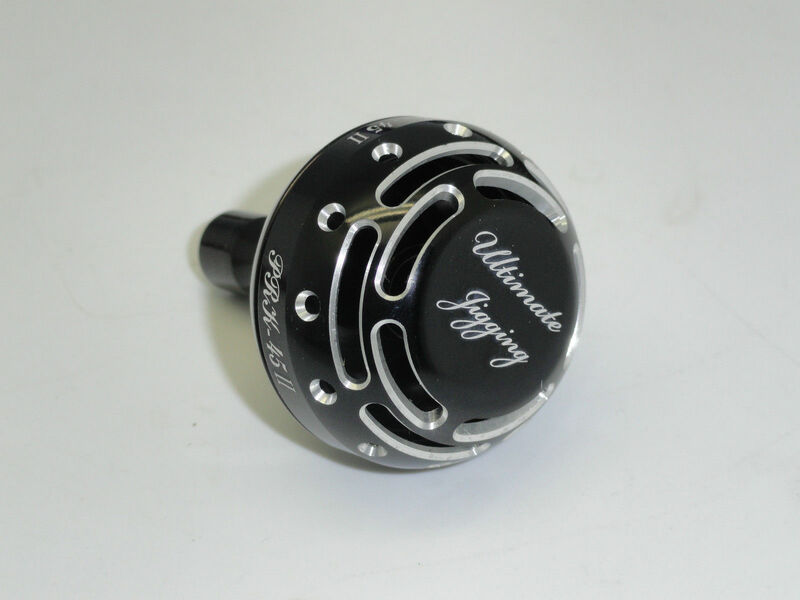 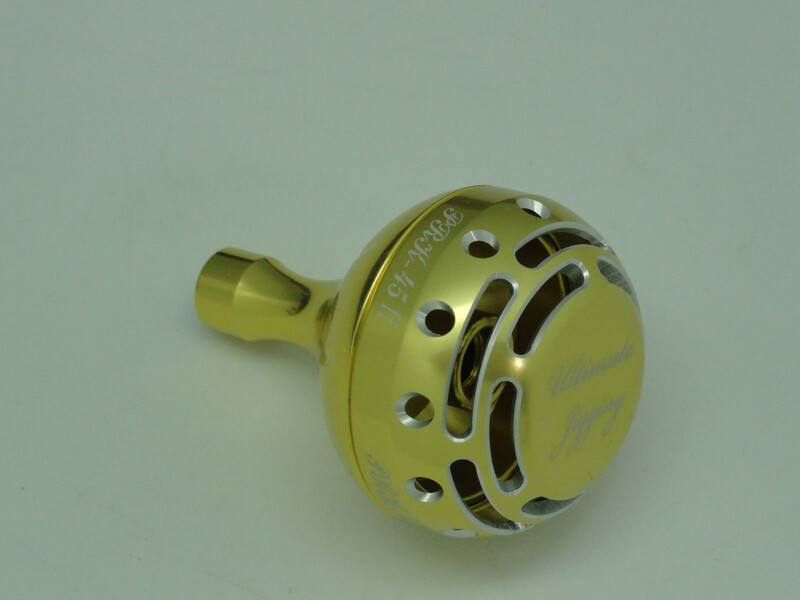 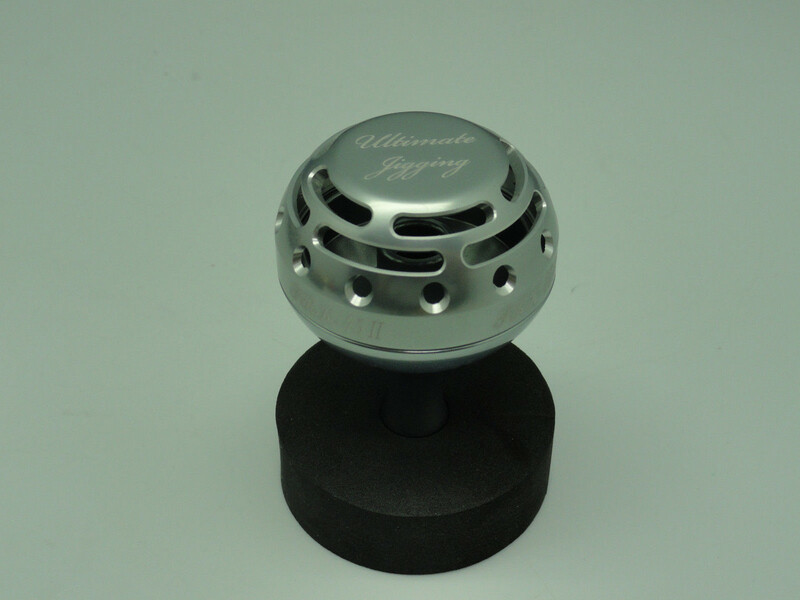 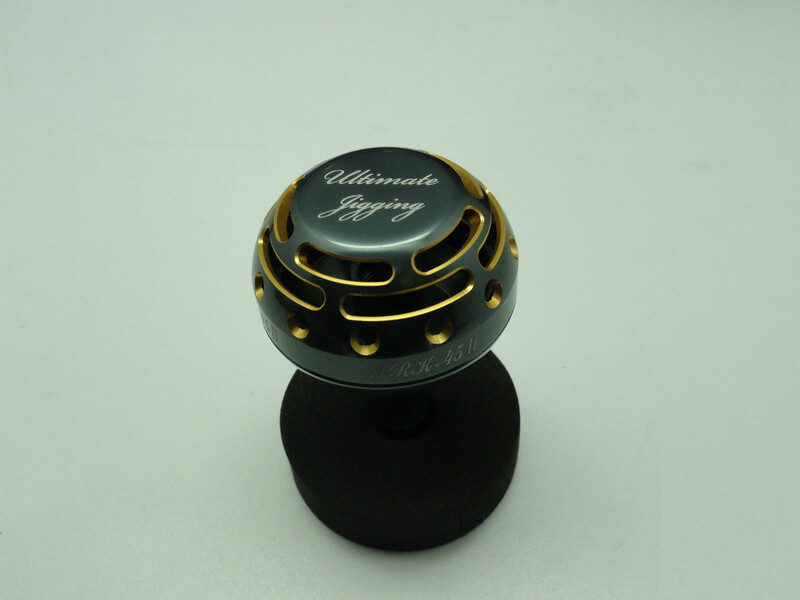 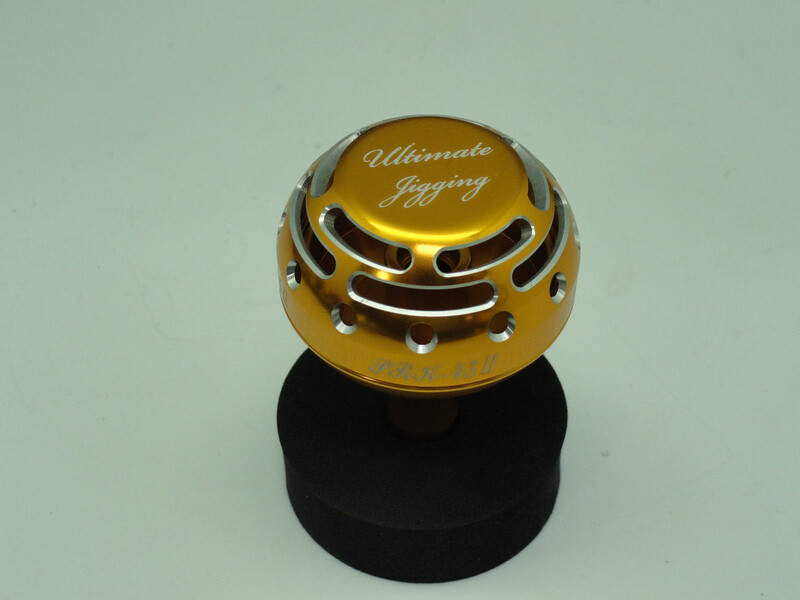 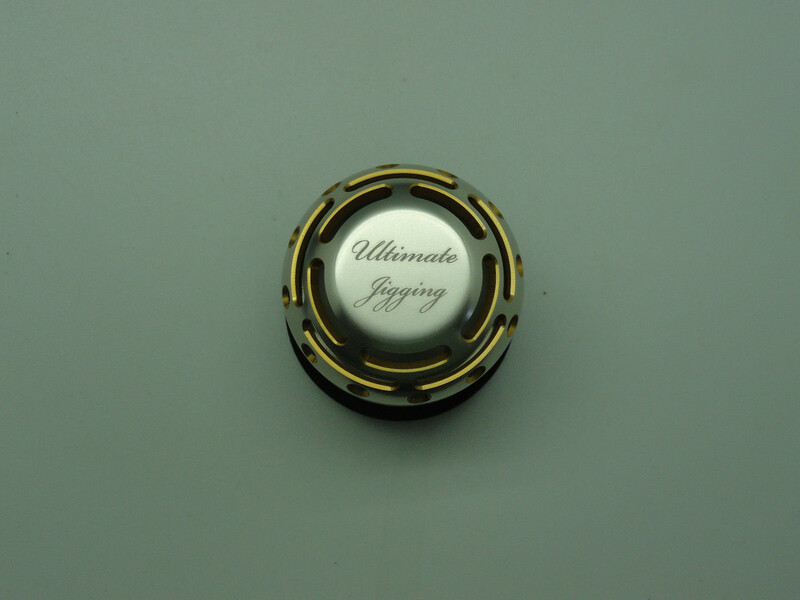 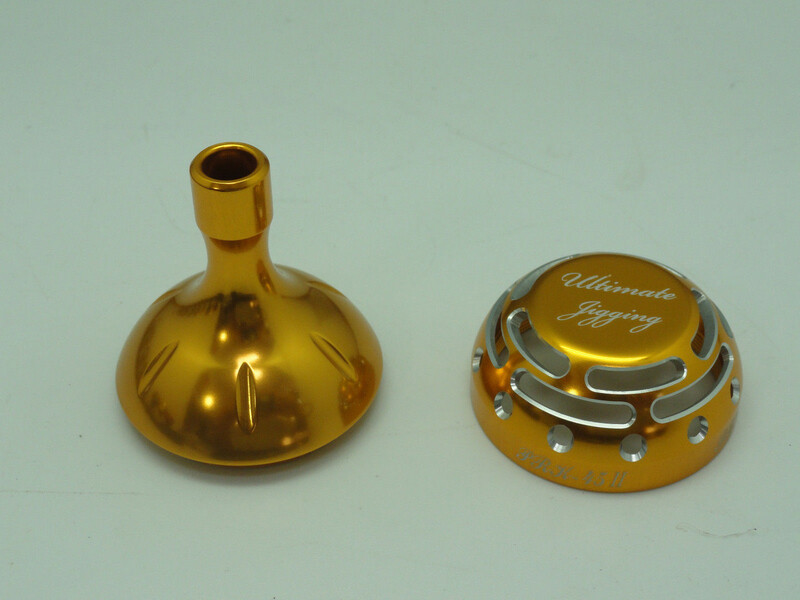 Ultimate Jigging 45mm Knob Type II is well crafted from solid 6061-T6 Aluminum stock with type two anodized and two-tone colors. 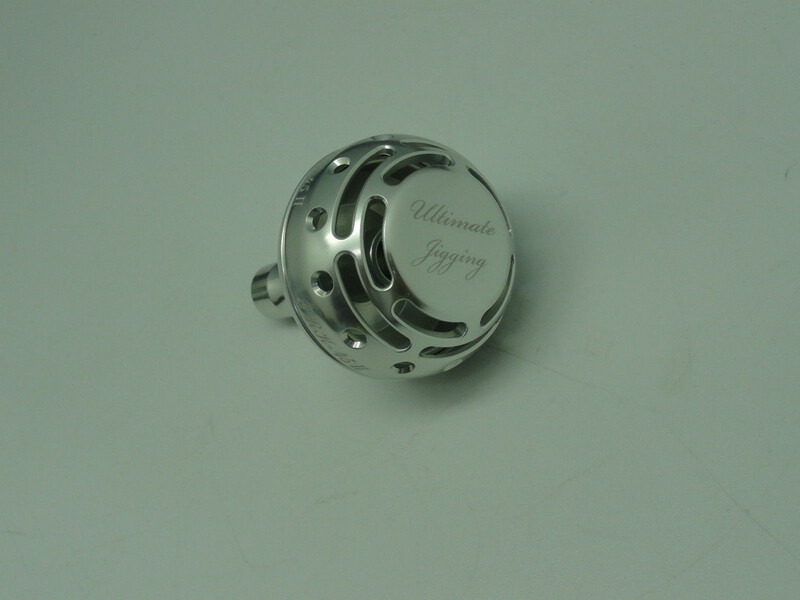 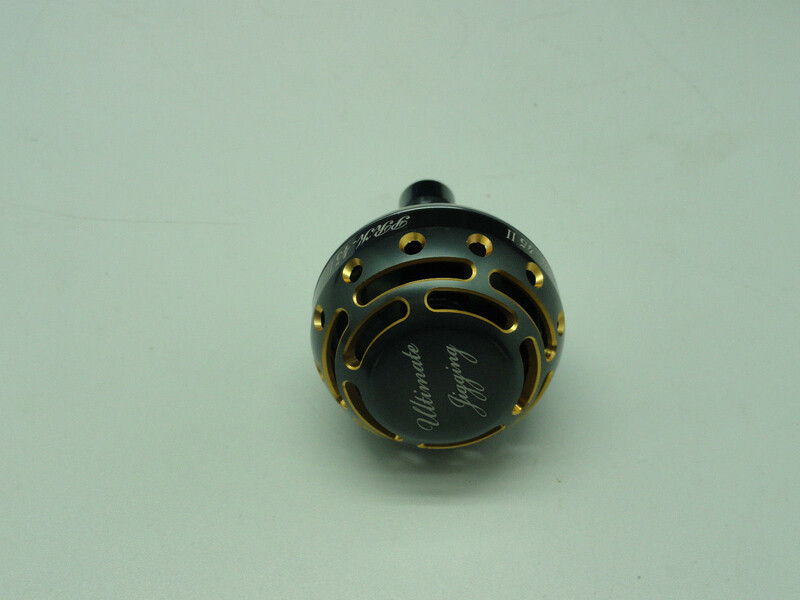 This Knob is a true art piece, it takes a lot of machine work, unlike other copies only have holes and lines on it. 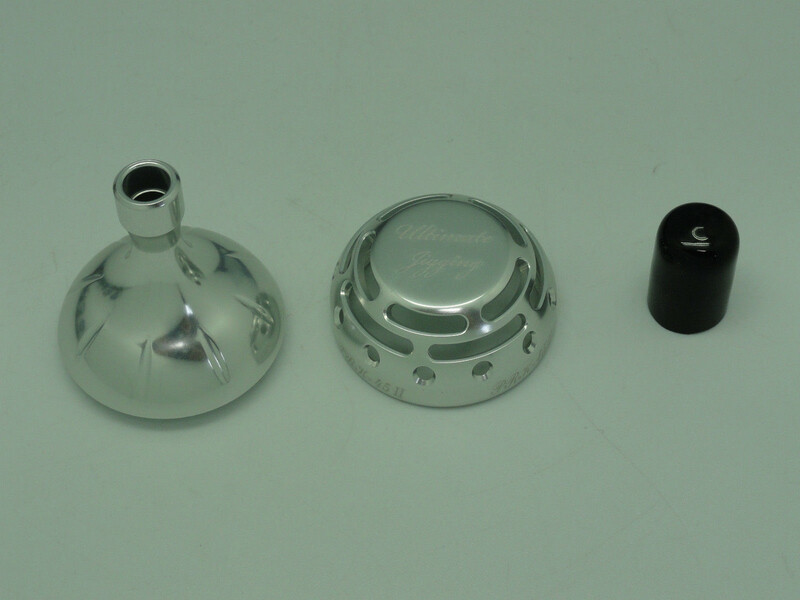 Indentation design on cup (bottom) increases the power of grip. 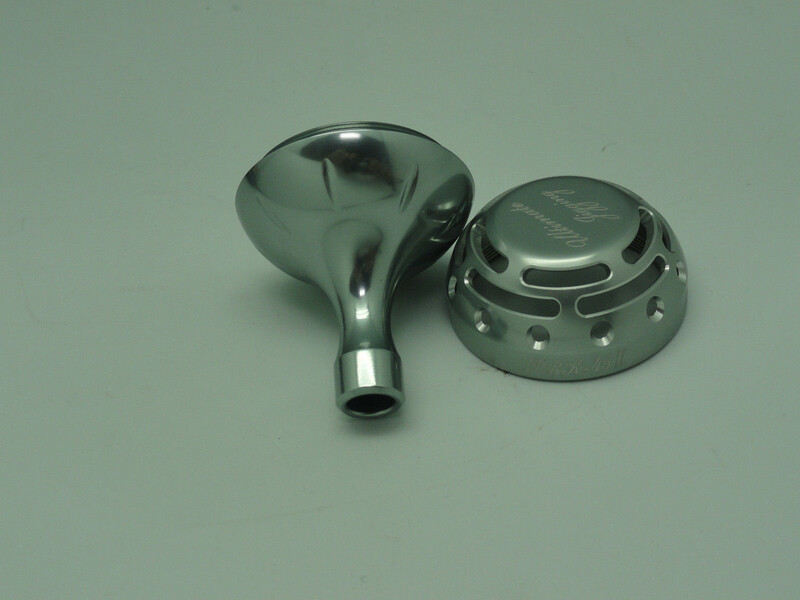 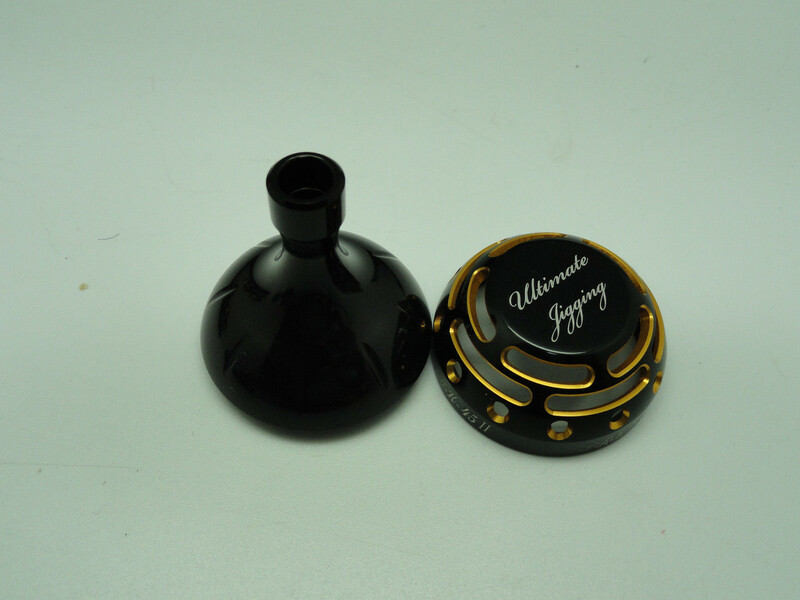 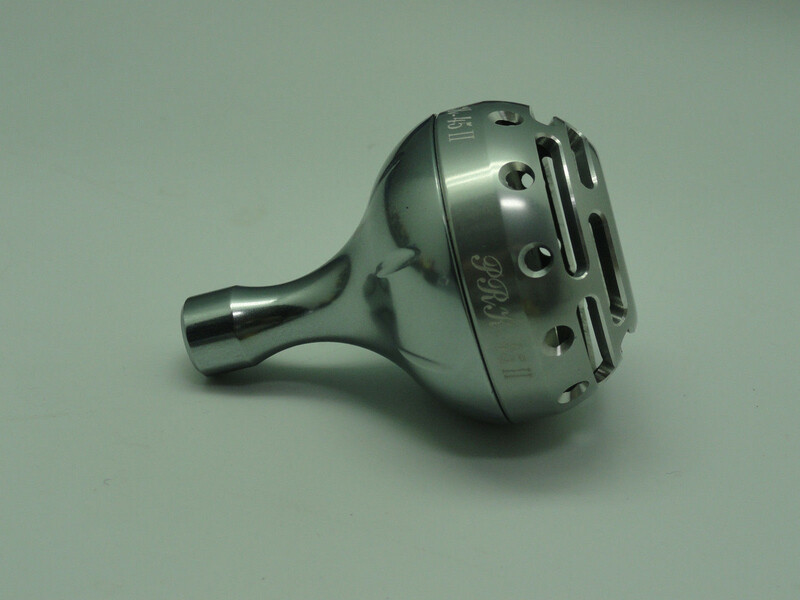 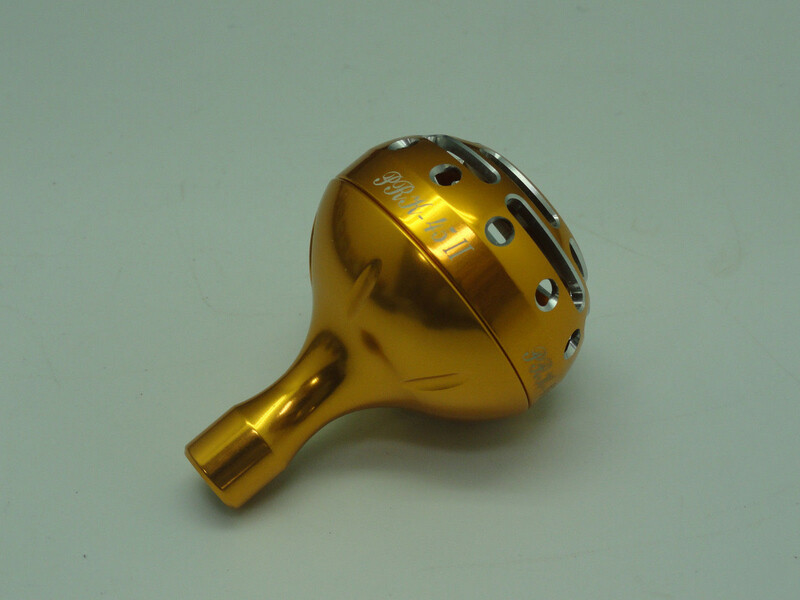 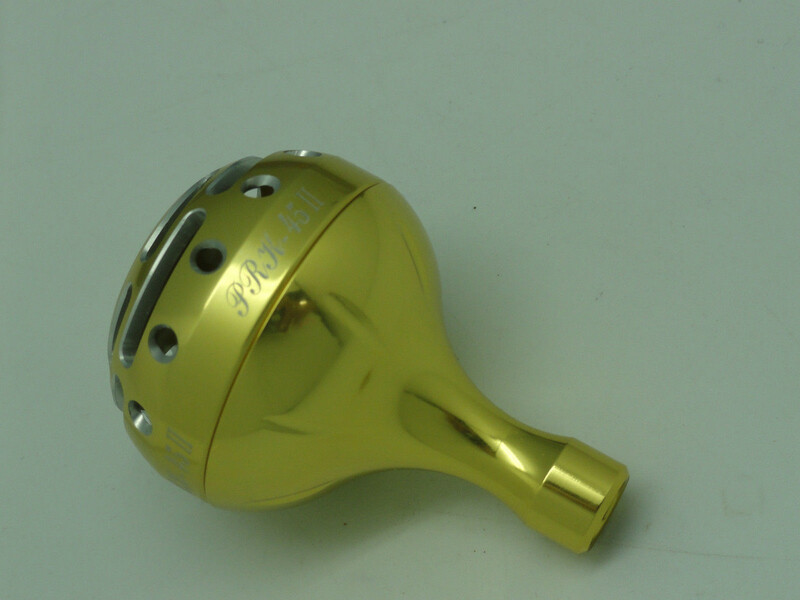 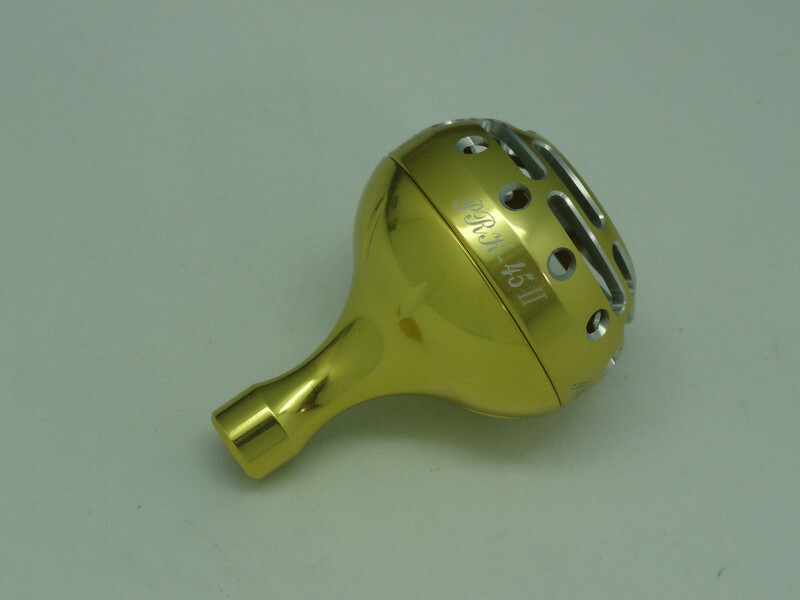 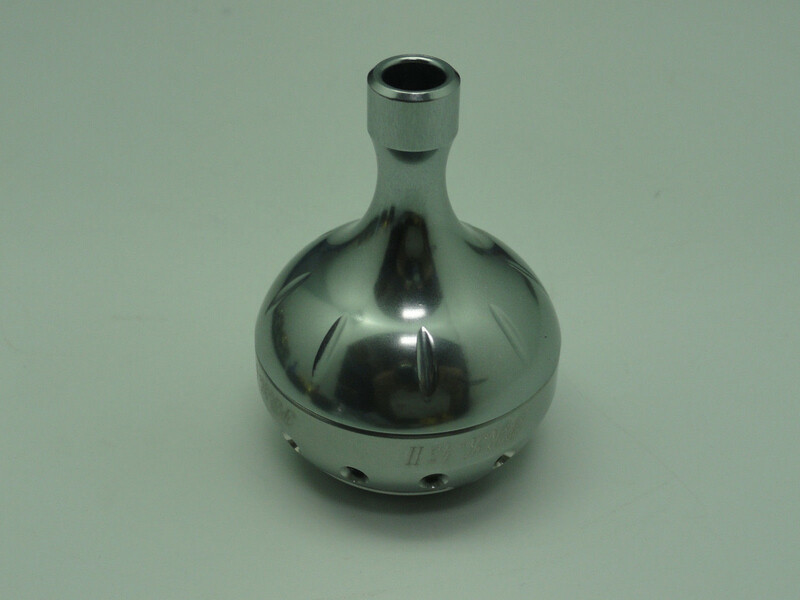 It is very stylish and light in weight only 43g/1.5oz. 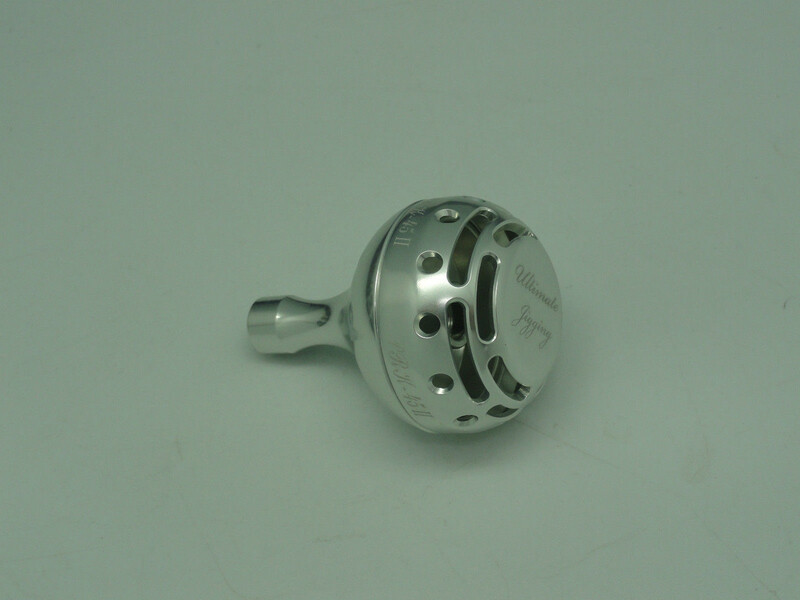 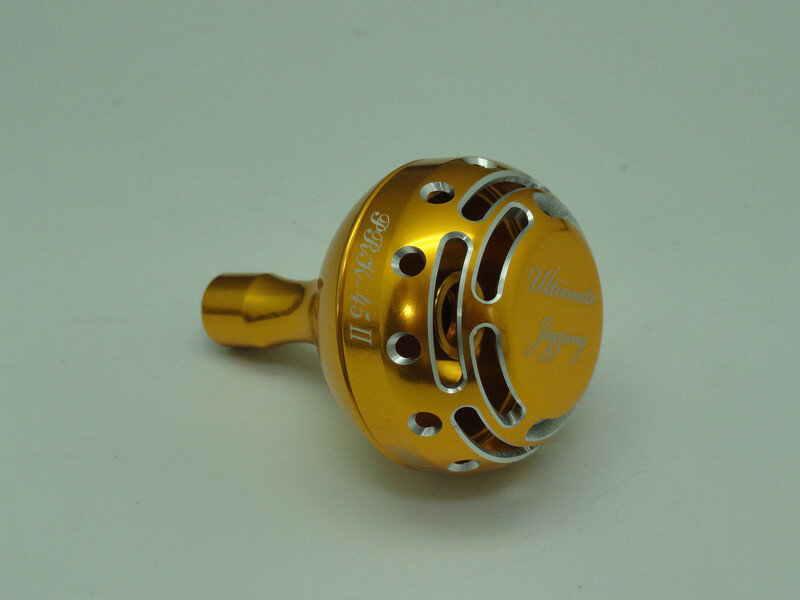 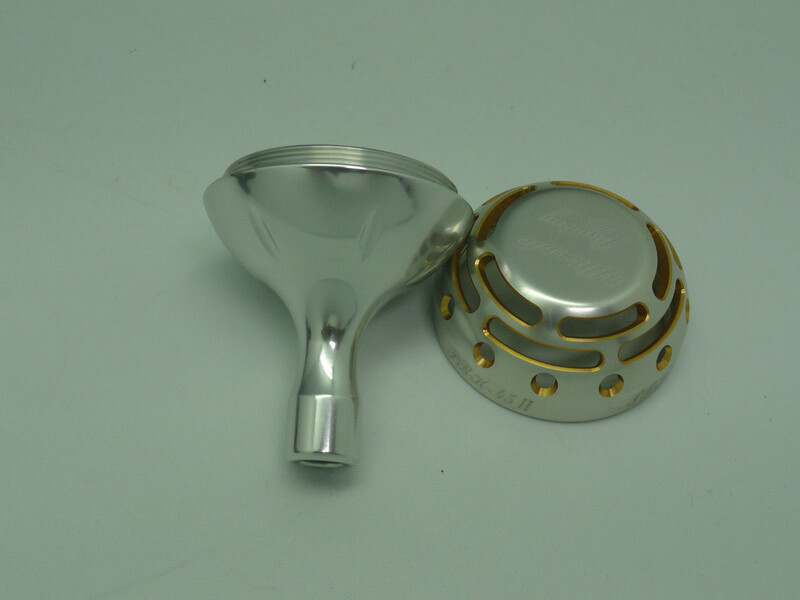 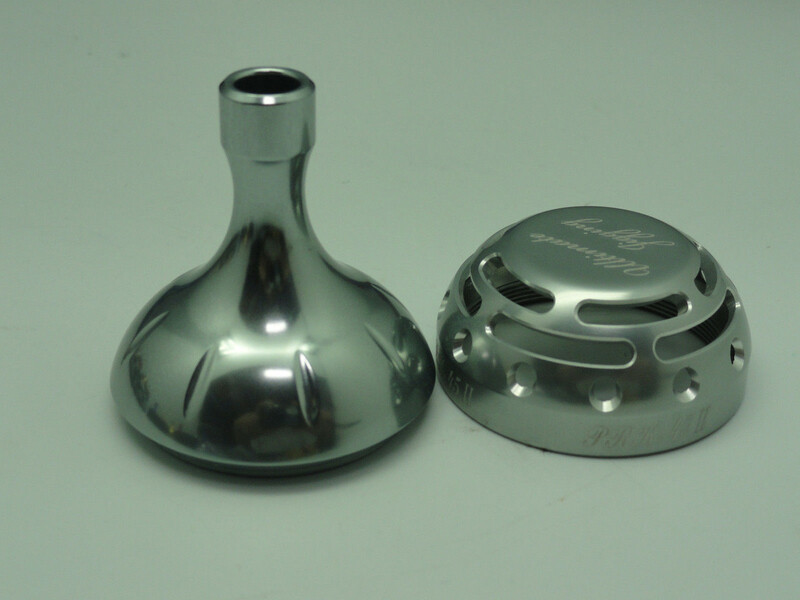 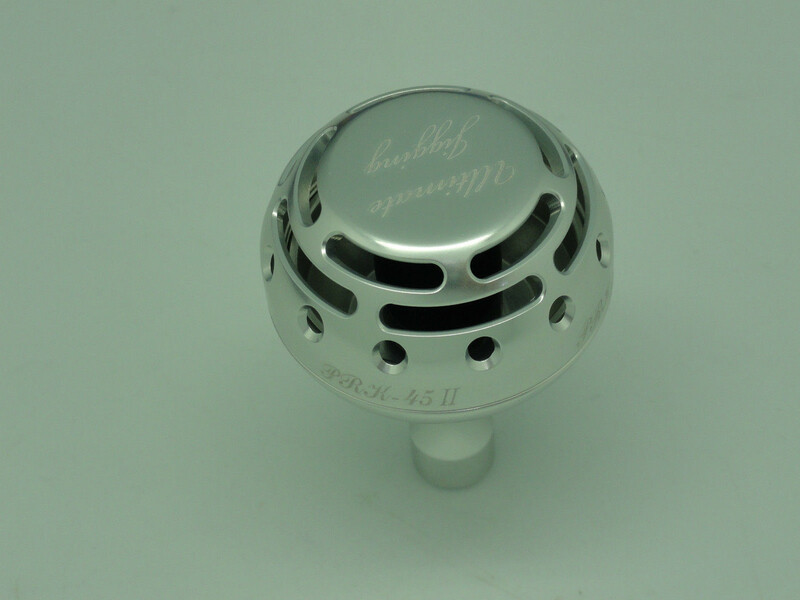 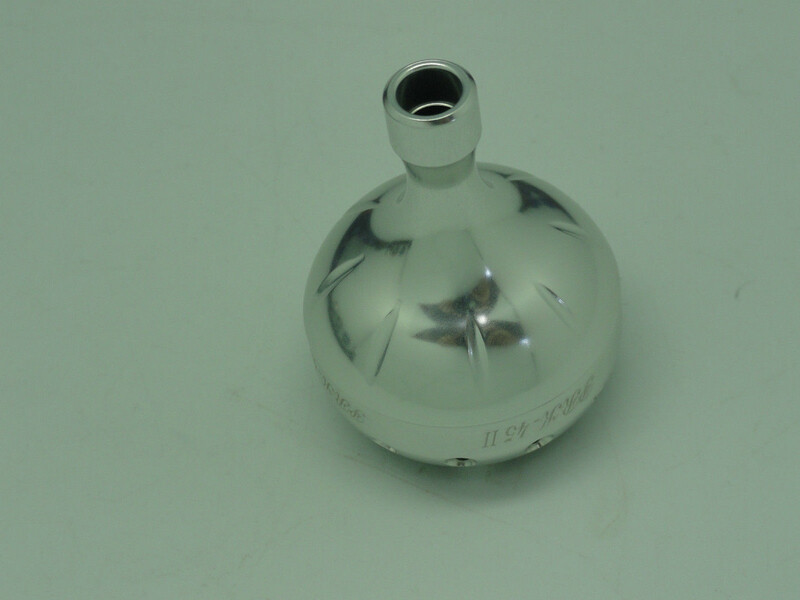 This fine Handle Knob is designed in USA and made in Taiwan. 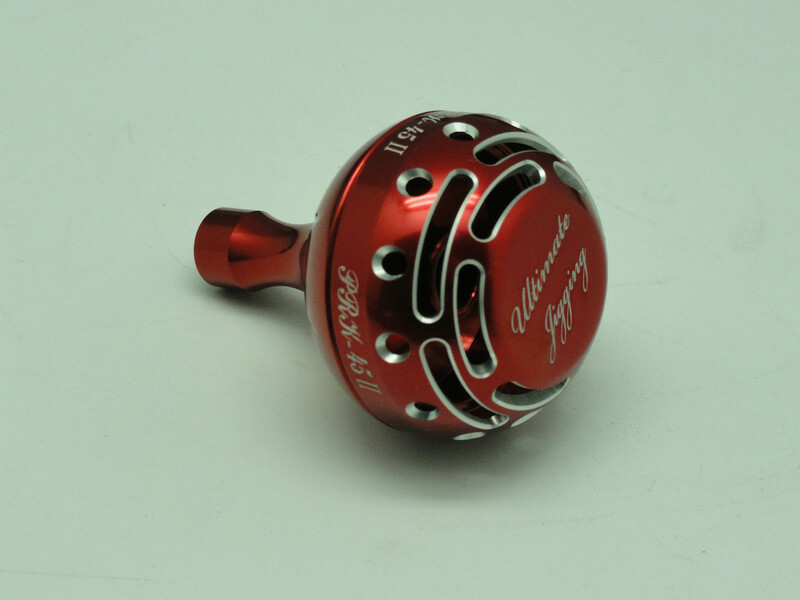 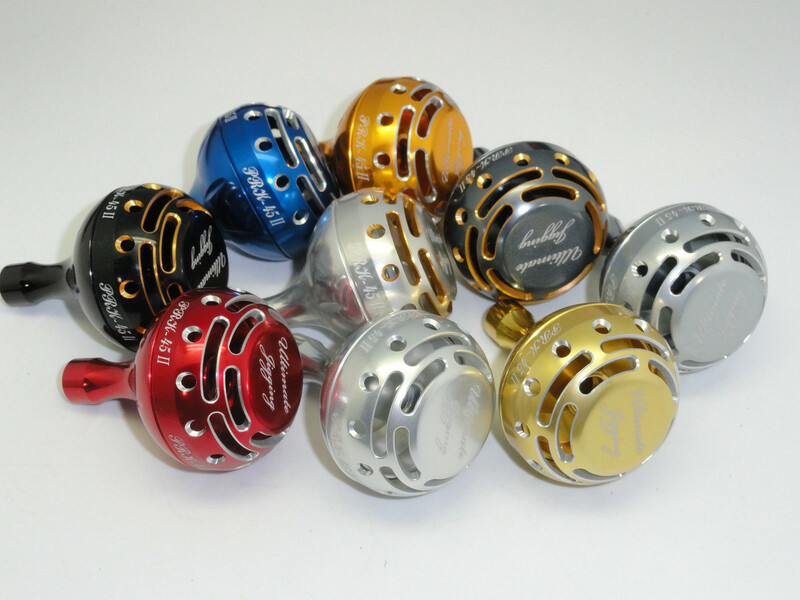 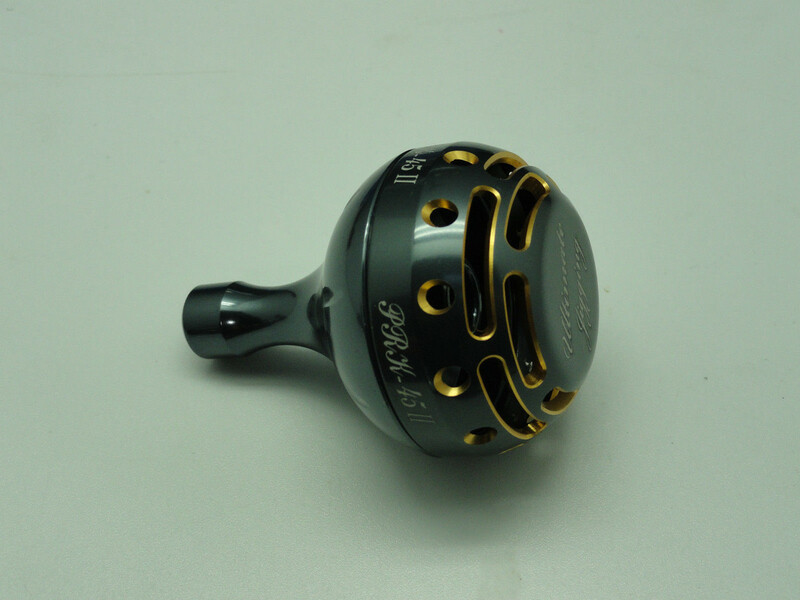 Each 45mm Knob Type II Shimano Model Package includes: one Ultimate Jigging 45mm Type II Reel Knob, an Instruction Paper, NS/S Kits and one 8mm Bearing. 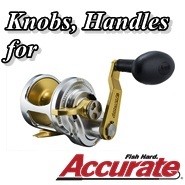 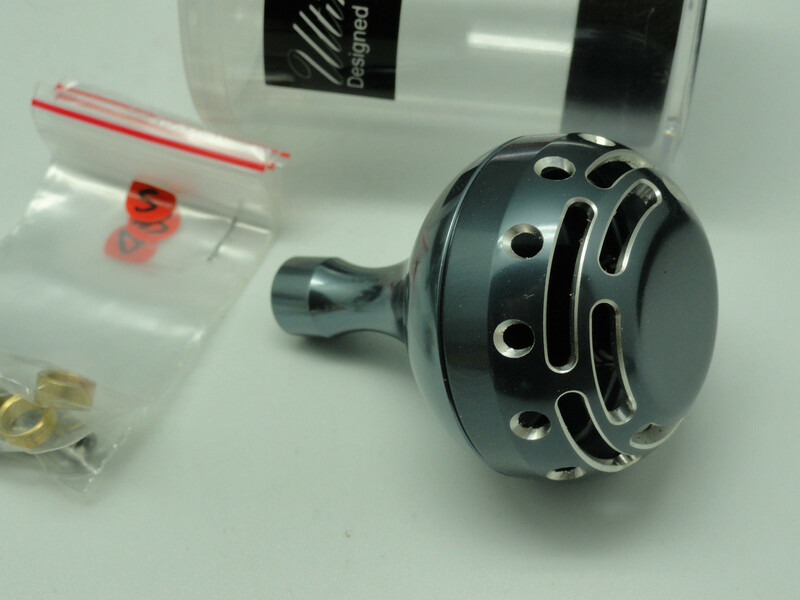 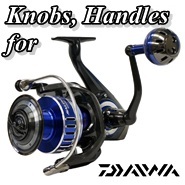 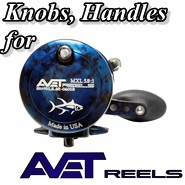 If you have any Accurate or Avet conventional reel with 5mm or 6mm round hole on the arm, please see "45mm Knob Type II - Accurate & Avet Model" Package; or if you have Daiwa Reels, please see "45mm Knob Type II - Daiwa Model" Package. 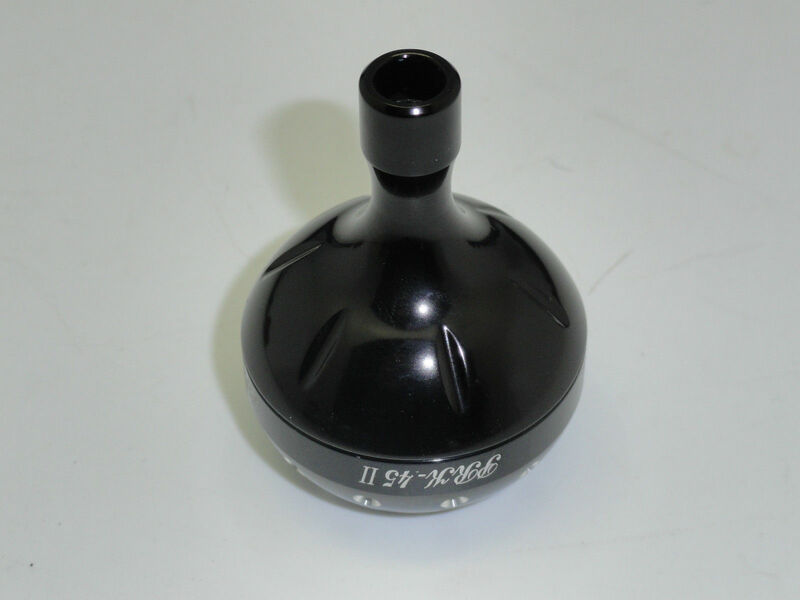 NS and S Kits associate with one 8x5x2.5 Bearing and one 9x4x4 Bearing/Sleeve. 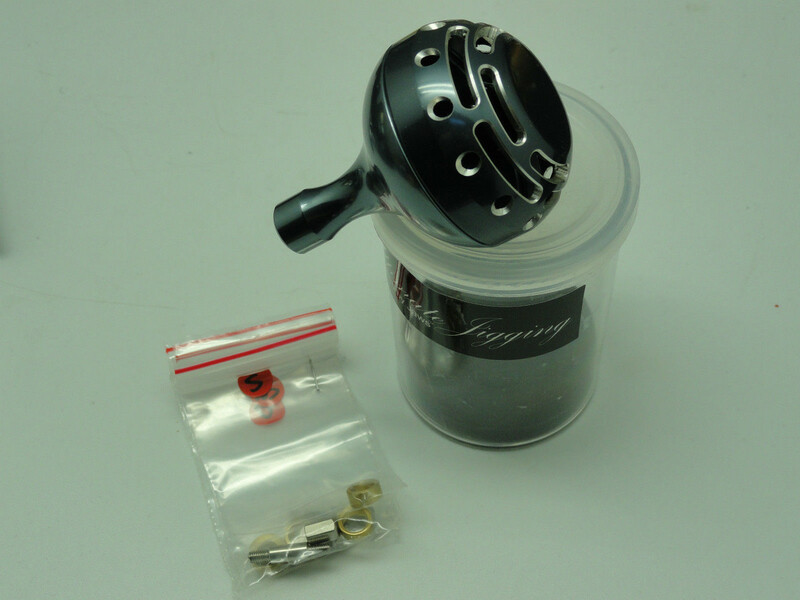 To install, please use the included Kits (NS/S), one 8x5x2.5 Bearing provided in this Package and your original 9x4x4 Bearing/Sleeve that removed from the original knob then follow the diagram instruction to install the 45mm Knob Type II. 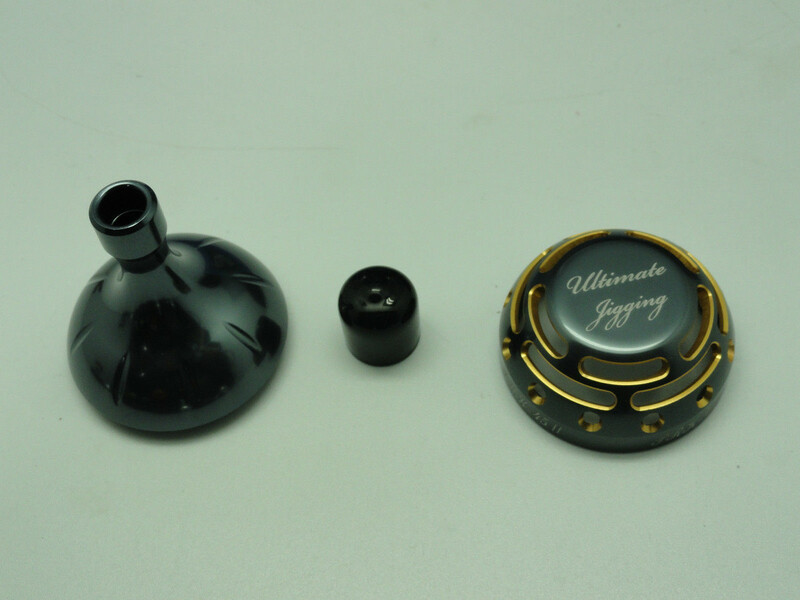 New Talica Reel has no Bearing inside of handle knob, it only comes with one black and one white plastic sleeves; both O.D. 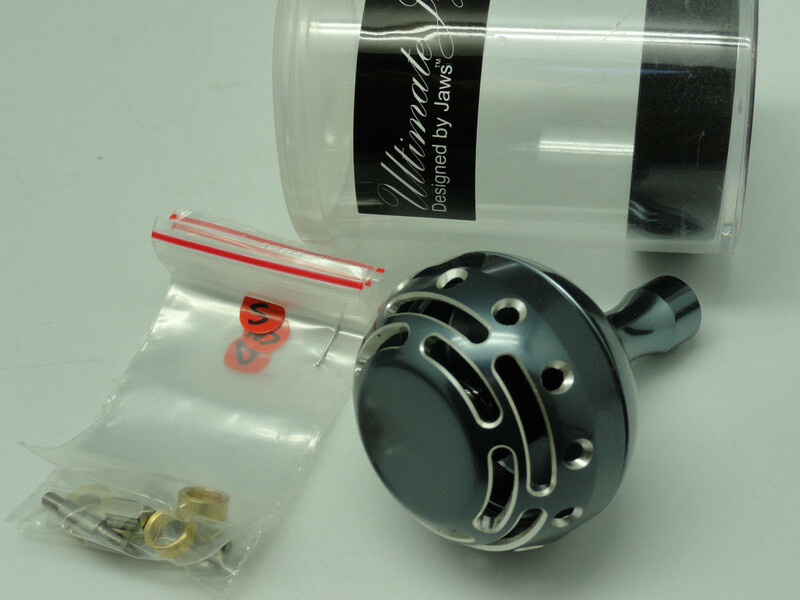 is 9mm. 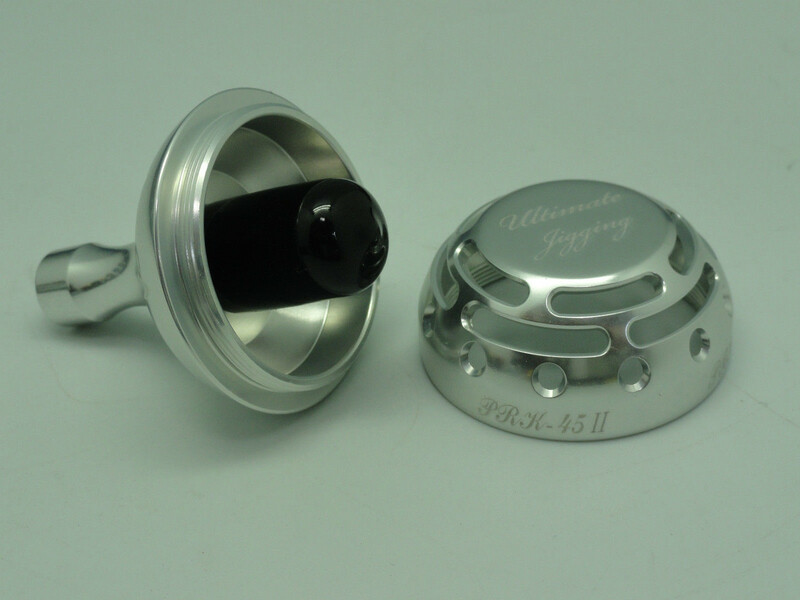 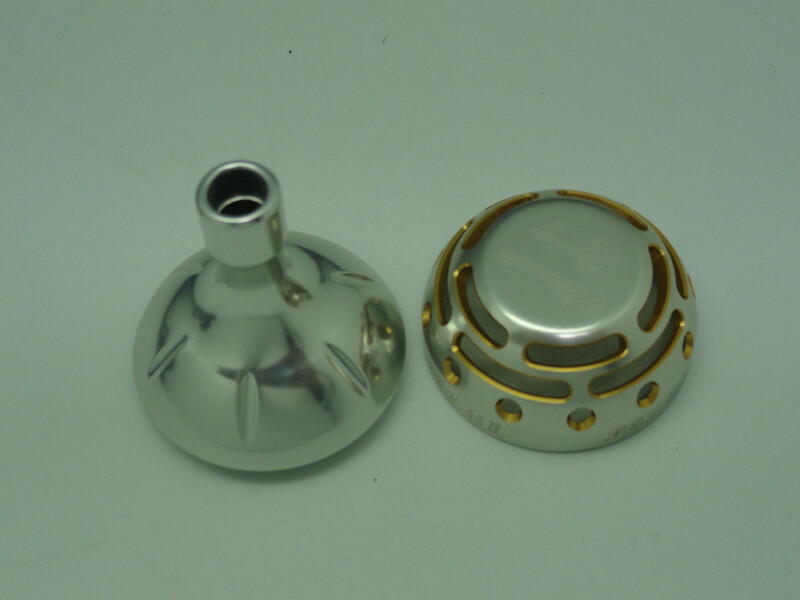 To install this 45mm Knob Type II needs one 8x5x2.5 Bearing included in the Package and one 9x4x4 Sleeve coming from your original knob with the NS Kit. 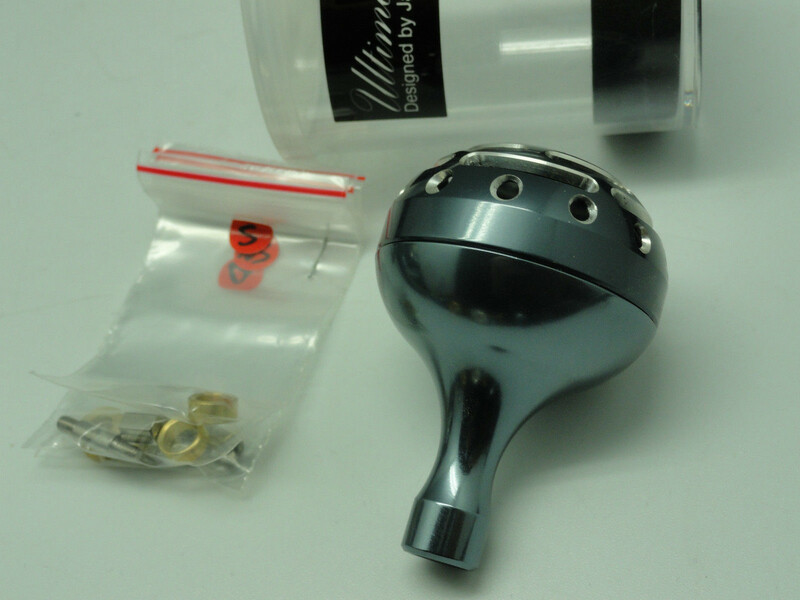 For Shimano Stella Saragosa 18000 ~ 25000 SW reels, please use the NS Kit associates with a 8*5*2.5 Bearing (included in this Package) and one 9x4x4 Plastic Sleeve coming from your original Knob; then follow the diagram instruction to install. 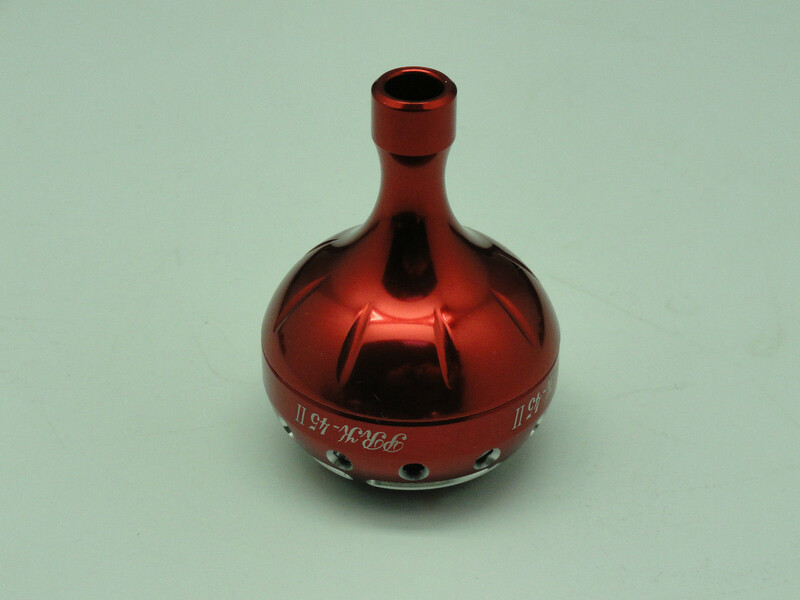 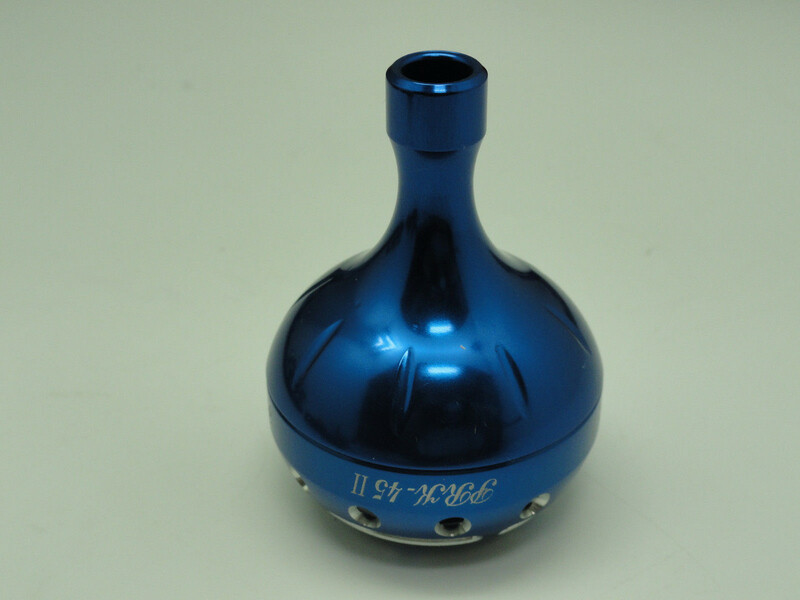 New Ocea Jigger 1500~5000 only needs one 8mm Spacer from NS kit and one 8x5x2.5 Bearing that included in the package to complete installation. 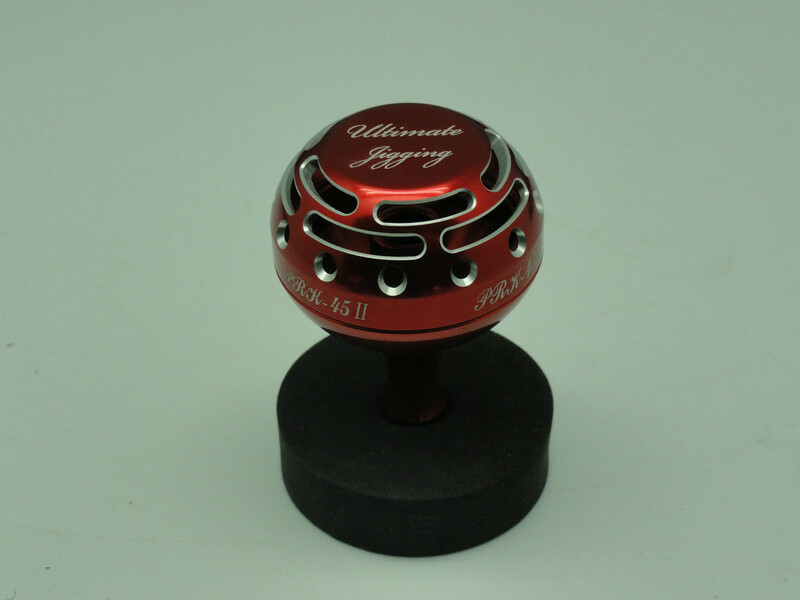 For more detail installation, please see "45mm Type II: Reel Knob Upgrade Steps". 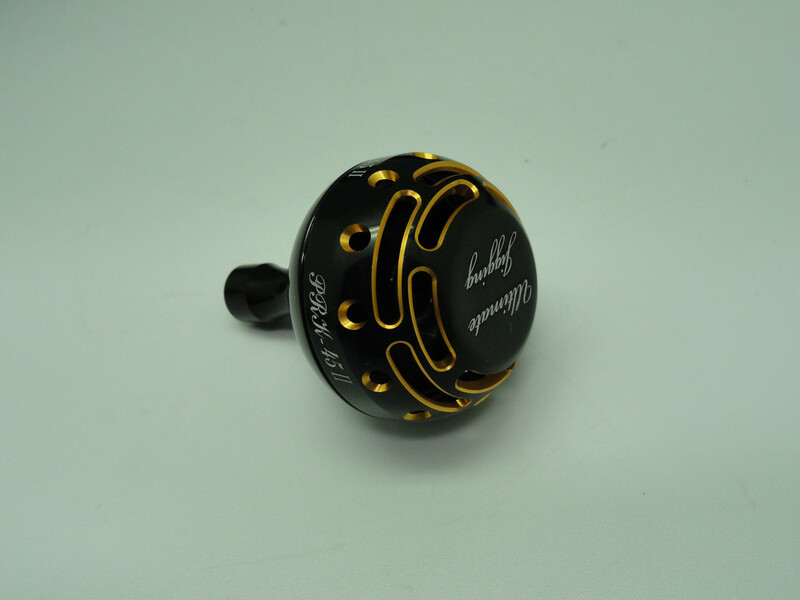 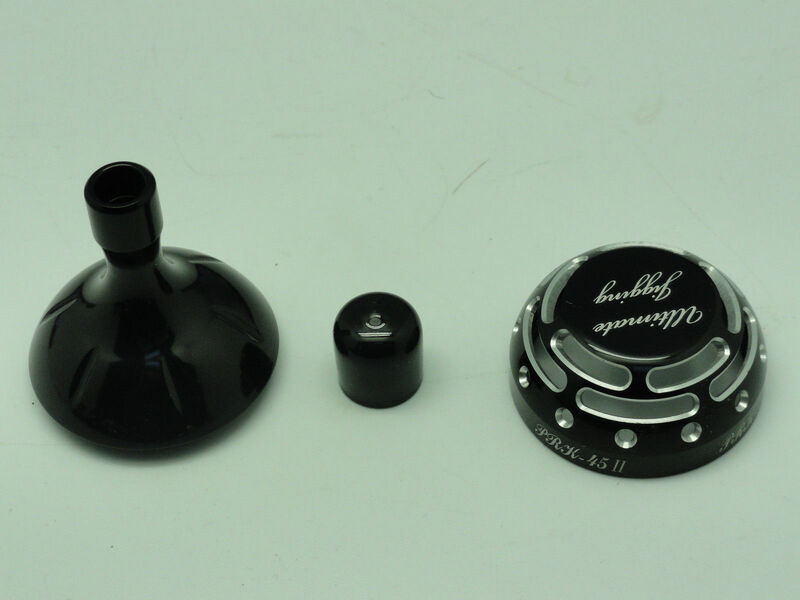 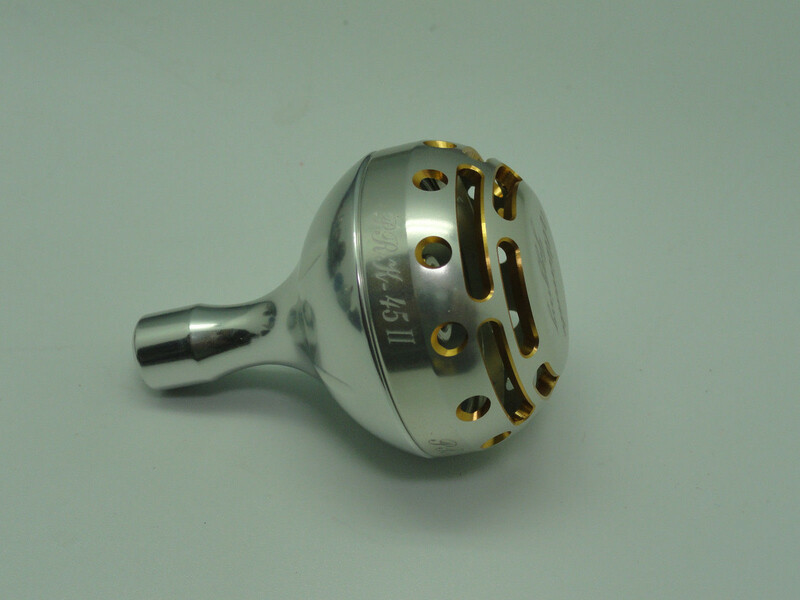 If you have other brand and model reel and like to install this 45mm Type II Knob, please email us at support@pbmfishing.com to consult. 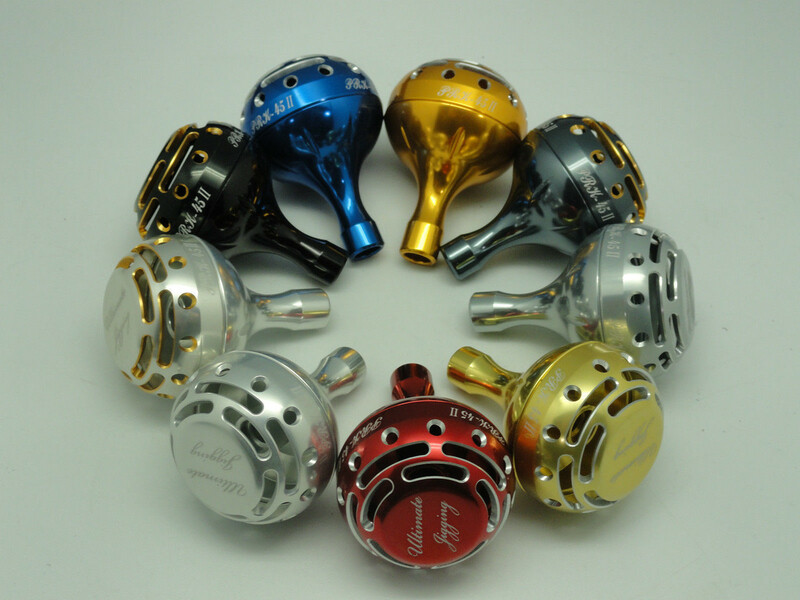 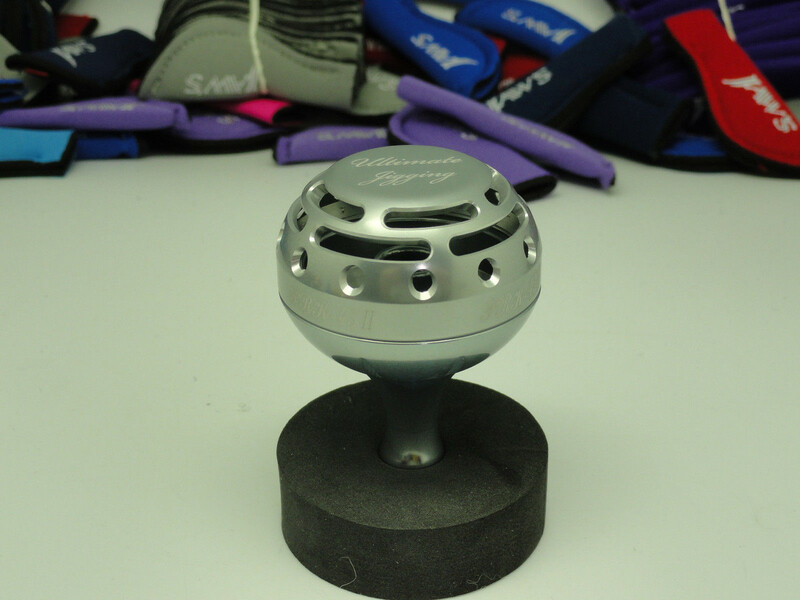 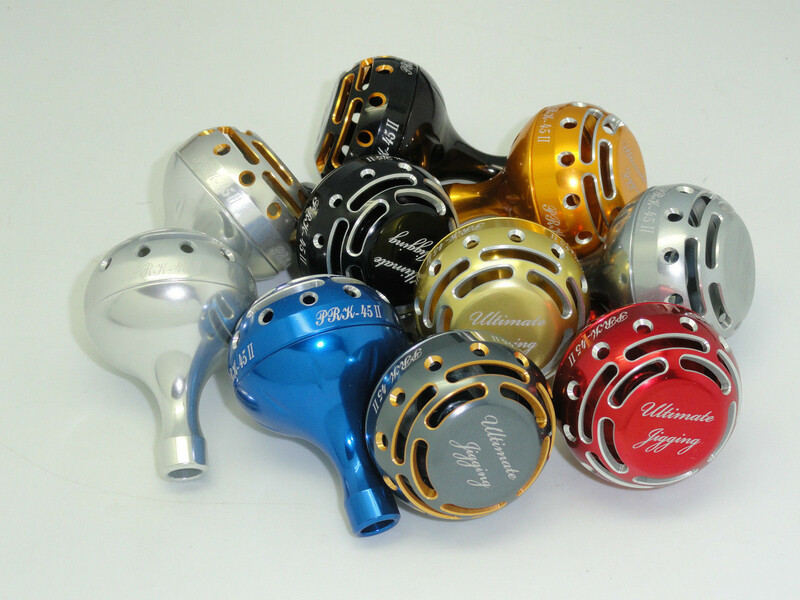 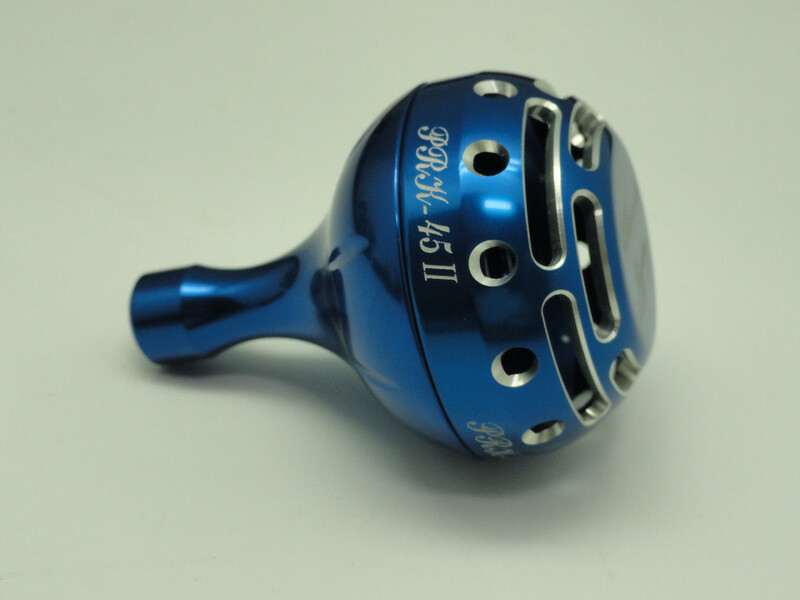 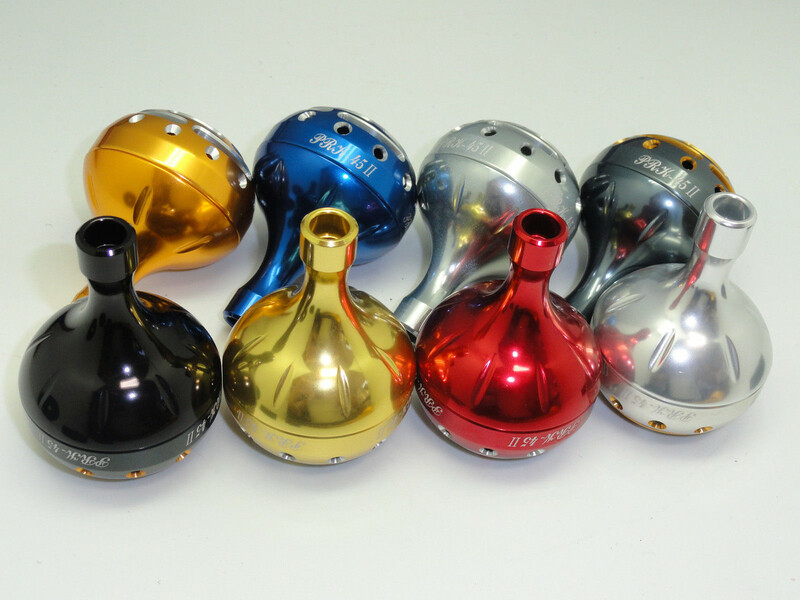 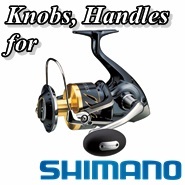 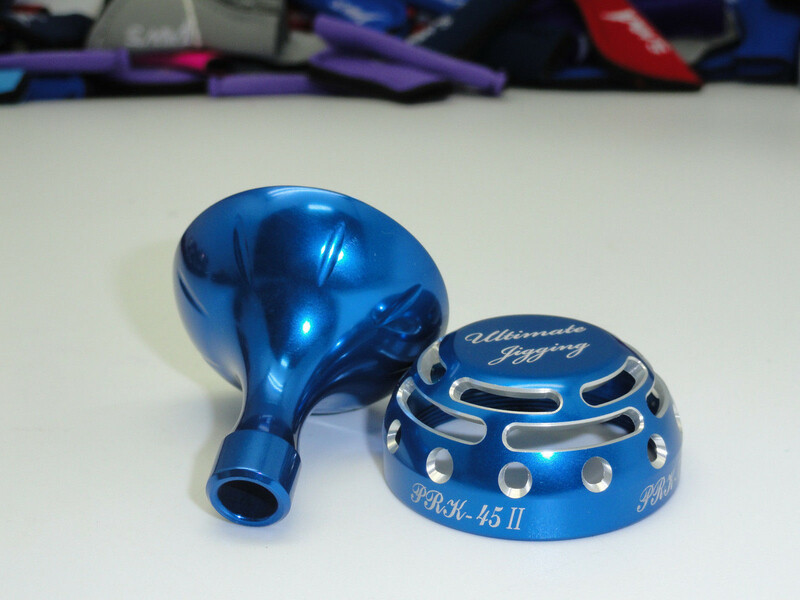 Each 45mm Knob Type II Shimano Model Package includes: one Ultimate Jigging 45mm Knob Type II, an Instruction Paper, NS/S Kits and one 8mm Bearing.